Left-leaning parties worked together to cut Theresa May's majority at the general election - was it a one-off or is the "progressive alliance" here to stay? One of the many surprises on 8 June was how Britain appeared to have turned the clock back to the era of two party politics, with 82% of voters casting their ballot for Labour or the Conservatives. Some of the surge in Labour's support may have been down to tactical voting, with left-leaning voters spooked by the prospect of a huge Conservative majority deciding to back whichever party they believed stood the best chance of beating the Conservatives in their constituency. Which, in most cases, was Labour. But in some parts of the country the choice was made easier for them. Local electoral deals saw some would-be election candidates stand aside to avoid splitting the "anti-Tory" vote. But despite warm words from some Labour and Lib Dem MPs, one party ended up doing most of the heavy lifting. Of the 41 seats listed by the Progressive Alliance, one of the organisations promoting tactical voting and cross-party cooperation, where "progressive candidates have stood aside to help another progressive candidate defeat the Tories", 38 of them were Greens, two were Lib Dems and one represented the Women's Equality Party. Not one Labour candidate stood aside, even though it was the Labour Party that got most of the benefit, in terms of extra votes and seats. The Green Party's co-leaders Caroline Lucas and Jonathan Bartley got behind the idea of electoral alliances as a way of forcing proportional representation on to the political agenda, having spent years getting nowhere with efforts to get candidates that back electoral reform elected through first-past-the-post. Last year's Richmond Park by-election, which saw the Greens stand aside to help Lib Dem Sarah Olney defeat the then (and future) Tory MP Zac Goldsmith, had shown them what was possible and they had the backing of Green party members. But the Labour and Lib Dem leaderships refused to play ball, rejecting their offer of a formal deal at June's snap election out of hand. Labour's shadow chancellor John McDonnell told the BBC: "I just think the electorate would be concerned if they thought parties were stitching up elections privately. I don't think that's the way forward. The way forward is to support and vote for the Labour Party." 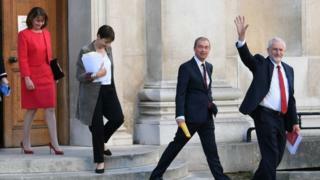 Lib Dem leader Tim Farron was equally dismissive, despite support for the idea among some in his party, saying the "only plausible route of any kind towards the Conservatives not winning a majority" was having a sizable Liberal Democrat group of MPs. It was left to local Green parties to strike their own deals, if they could. It worked in some places, most notably Brighton Pavilion, where Caroline Lucas doubled her majority, after the Lib Dem candidate stood aside, as payback for Green support in Richmond Park. But her result was a rare bright spot in a dismal night for the Greens, who failed to gain any of their other target seats, and saw their vote drop from 1.1 million in 2015 to just over 500,000. It was a bad night for smaller parties in general. UKIP saw an even more dramatic collapse in its share of the vote than the Greens. The Lib Dems also saw their vote share squeezed - but only the Greens stood aside in significant numbers to aid other parties. On the day after the election, the Green Party's co-leader Jonathan Bartley hailed the "brave" decision by 24 Green candidates in marginal seats to stand aside, which he said had made a "big difference to the election result". But that's not how some of the candidates-that-never-were felt. Green Party activist Jill Perry, who opted not to stand in Workington, said she now has "regrets" about doing so because she does not think it made any difference to the result, which saw the Labour candidate Sue Hayman retain the seat with a slightly reduced majority. It also deprived local Green members and supporters - including herself - of the opportunity to vote for their party, which on nuclear power, nuclear weapons and airport expansion, to name just a few issues, is diametrically opposed to the official Labour position. "I voted with a heavy heart because, obviously, I could not vote Green," she says. "It was a very difficult decision. It wasn't a personal decision, it was a group decision, but the group was very divided with strong feelings on both sides. "Really, I don't think it made any difference where candidates stood down" because a lot of people voted tactically to prevent the Conservatives getting a "massive majority" and, as a result, "everybody went back into the Conservative and Labour silos". The local Labour Party appreciated their gesture but Greens had been "put under an awful lot of pressure" by Labour activists in areas where they refused to stand aside, she added, and some Labour activists had been "very aggressive towards them". "In solidarity with those groups, I think we should stand next time," said Ms Perry. Andy D'Agorne, leader of the Green group on York City Council, told the BBC he does not regret standing aside for Labour at the general election but he would not do it again, unless Labour was committed to proportional representation. The Greens have strong support in York, gaining 10% of the vote at the 2015 general election in York Central, but Mr D'Agorne said the unexpected surge in the Labour vote has made it a safe seat for Jeremy Corbyn's party, rendering any future gestures of solidarity unnecessary. Nicole Haydock, co-ordinator of Bury Green Party, which opted not to run candidates in June, said the "backlash in the party after the election" was because "most people thought the progressive alliance meant we are standing down where Labour has a chance of winning" when it was actually about getting an agreement to back proportional representation. Green activist John Coyne refused to stand aside in Wirral West, despite pressure from local Labour activists and members of Momentum, to help Labour's Margaret Greenwood hang on to the seat she had won from Tory Esther McVey by 417 votes in 2015. The 429 votes Mr Coyne received in June might have made all the difference in another close contest, but Ms Greenwood was returned as Wirral West's MP with a majority of 5,365. Mr Coyne said: "If Labour said, 'yes we want PR' then that would make a big difference but all that's happened in discussions about alliances is that there has been an attempt to get people switching from Green to Labour, there has been no element of reciprocity at all, in this relationship. "And for that reason, if no other, I think there is no real future for it." The BBC understands Liverpool Green Party plans to table a motion at the party's annual conference in October to rule out future alliances unless there is a PR deal on offer. There is also the practical concern that the electoral pacts have hit the Green Party in the wallet, as Short Money is handed out by Parliament in line with the number of votes parties get. In 2016/17 the Green Party of England and Wales got £216,994 in Short Money. It will be a lot less this year. Caroline Lucas said it was time for "reflection and planning" in the Green Party and has promised to listen to the membership about future electoral deals. She said it was "clear" that the local Green activists who stood aside in June "helped cut down the Conservative majority". But she added: "The commitment to forming alliances was always about advancing significant electoral reform to give every voter a voice. "We want to forge a new kind of politics, and simply tactical voting under first past the post does not even begin to rise to that challenge. "Sadly there was no leadership from either Labour or the Liberal Democrats to put the urgent need for a fairer voting system at the heart of this election nationally." Frances Foley, campaign co-ordinator of Compass, the cross-party pressure group that set up the Progressive Alliance website and used tactics and personnel borrowed from Bernie Sanders in the US to promote it around the country, said she could understand how some Greens felt "chastened" by the drop in their party's vote share. But, she added, "despite that there is still a really strong appetite for the progressive alliance in the Green Party". There was also far more enthusiasm for cross-party cooperation, and proportional representation, among Labour activists than the party leadership, she claimed, and that change would eventually come "from the ground up". According to Compass's own research, "progressive" candidates performed 5.7% better where there was an electoral deal in place. She said the Labour leadership should view their success on 8 June as a "shared victory," as a handful of Labour MPs, such as Clive Lewis, in Norwich South, and Tulip Siddiq, in Hampstead and Kilburn, had done - and it would be a mistake for them to believe they could win a general election on their own. To supporters like Ms Foley, the progressive alliance holds out the prospect of an end to petty tribal politics, as parties with similar world views - pro-European, anti-austerity, greenish - work together for what they see as the "common good". The combined forces of the SNP, Plaid Cymru, the Lib Dems, Labour and the Green Party, as well as smaller outfits like the Women's Equality Party and the NHS party, add up to a "progressive" majority, they argue. More than enough to beat what they call the "regressive alliance" of the Tories, UKIP and the Ulster Unionists. But to have any future it is going to take a major change in attitude at the top of the Labour Party to convince the Greens and other smaller parties it is worth the sacrifice.